To say that there were a lot of delicious meals while filming Kimchi Chronicles in Korea is a serious understatement. From Jeonju bibimbap to freshly caught seafood in Busan, it’s hard to pick a few favorites. However, one of our first dinners in Korea ranks high on the list. Our inaugural crew dinner was held at Saemaeul Shikdang , a super popular little restaurant in Seoul that is legendary for its 7 minute kimchi jjigae. Kimchi jjigae is one of Korea’s most famous comfort foods. It’s a simple stew made with kimchi, and generous amounts of pork. 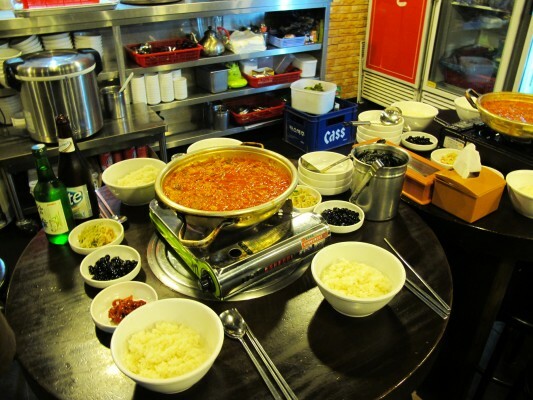 At Saemaeul Shikdang, the jjigae is cooked at a rolling boil and served in record time, without sacrificing quality. It’s full of flavor, incredibly satisfying, and despite its simplicity, it remains one of our most memorable meals. Marja’s famous for her jjigaes, and she even jazzes them up with additional garnishes, including American cheese, and even tuna. It’s a cinch to make, and is also a great way to use overly fermented kimchi that’s been sitting in the fridge for a few too many weeks. What kinds of jjigaes are your favorite to make?